Este Sábado 26 de Noviembre En Sala El Tren, Granada. Desde las 20:30h. 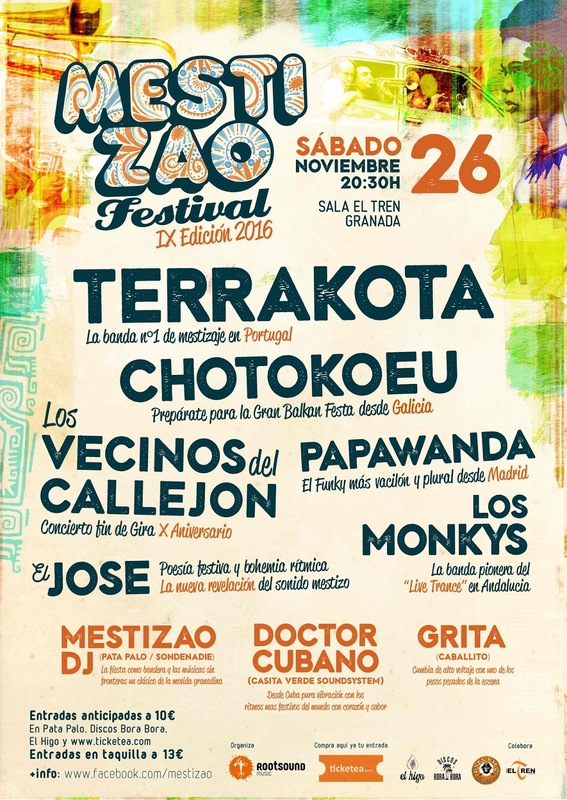 Esté sábado 26 de Noviembre llega a Granada la novena edición del festival MESTIZAO. El encuentro invernal más importante para los aficionados a las músicas mestizas y de corte multicultural. Un festival modesto e independiente, pero con buen gusto, calidad y mucho cariño. Calor y sol en plena noche invernal granadina para hacernos viajar a través de los ritmos de todo el mundo mediante el lenguaje universal, la música. El Funky más vacilón y plural desde Madrid. Poesía festiva y bohemia rítmica. Banda pionera en Andalucía del "Live Trance". Concierto fin de gira X Aniversario. La banda No1 del “Afro World" en Portugal. La gran Balkan Banda desde Galicia. (Patapalo / Son de Nadie) La fiesta por bandera y la música sin fronteras. (Casita Verde) Desde Cuba pura vibración a todo ritmo. (Caballito) Cumbia de alto voltaje. El grupo interpreta música original, donde en las composiciones se puede ver una visión actual y personal del Jazz. La sonoridad del grupo responde a un sonido en donde se mezclan la tradición de la música improvisada y el Jazz, con sonoridades actuales en donde cada uno de sus integrantes, desde sus distintas y variadas influencias, aporta sus características al resultado del sonido grupal. 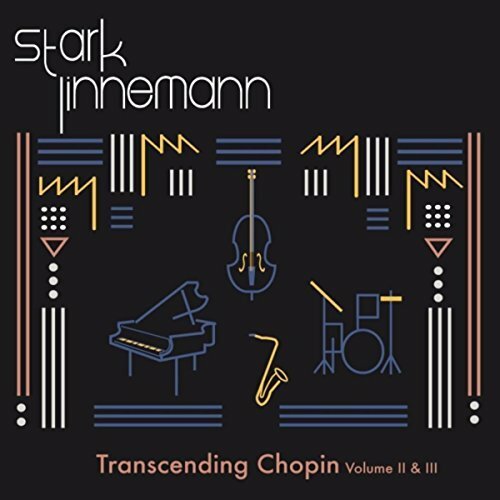 With the launch of the third album Transcending Chopin Volume 2 & 3 in the fall of 2016, the StarkLinnemann Quartet is a fact. For a long time the co-leaders of the band Jonas Linnemann (drums) and Paul Stark (piano), have been searching for musicians who are willing to conform to the broad vision of StarkLinnemann. Since its foundation in 2012 they have worked with diverse line-ups and have shown to be very versatile in terms of musical styles and genres. This can also be heard on their albums Awake (2014) and Transcending Chopin Volume 1 (2016). 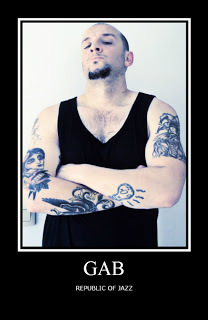 The genre of Stark Linnemann is best described as: Universal Crossover Music. Bassist Vasilis Stefanopoulos has been a constant factor with StarkLinnemann since its foundation and is now also part of the Quartet. Just recently, Linnemann and Stark have found in Iman Spaargaren a tenor saxophonist who complements the trio perfectly with his passionate playing. All musicians of the StarkLinnemann Quartet are playing at a high level and have a broad musical mindset. Looking ahead the Stark Linnemann Quartet wants to keep on producing crossovers between classical music and jazz as well as releasing original work with an adventurous character. In the coming months the StarkLinnemann Quartet will perform the music from the album Transcending Chopin Vol. 2 & 3 live at several venues in the Netherlands. More information can be found at events. 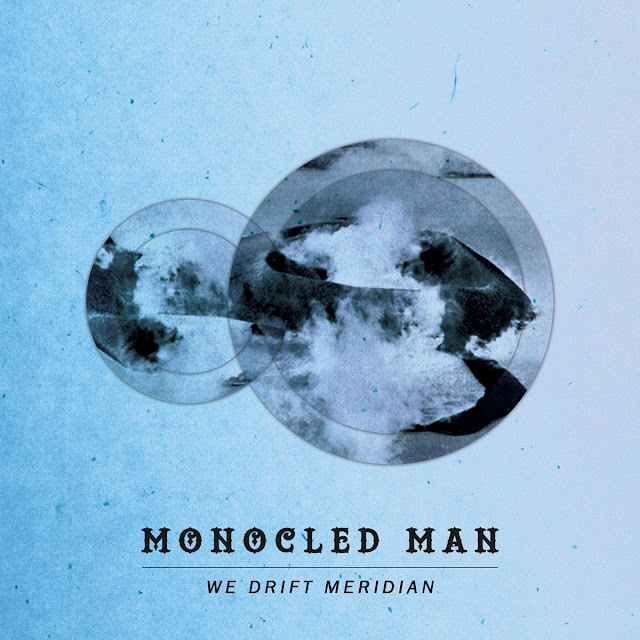 You wouldn’t even know they were there… but the minute islands and atolls amidst the vastness of our world’s oceans provide intriguing inspiration for Monocled Man’s second album, We Drift Meridian a concept devised by trumpeter, multi-instrumentalist and composer Rory Simmons. With established colleagues Chris Montague (electric guitar) and Jon Scott (drums/electronics), plus vocal contributions from Emilia Mårtensson and Ed Begley, Simmons layers-up haunting electronic and acoustic soundscapes which reflect the remoteness and sometimes curious histories and characters associated with these far-flung, isolated spaces. Monocled Man’s ethos of through-composition and open improvisation is carried over from their debut release on Whirlwind, Southern Drawl but here, a distinctive new dimension is introduced, emanating from Simmons’ predetermined, home-studio-produced sonic environments. Cinematic beds of sound, carefully crafted with modular synths, sequencers and chopped audio, are all fashioned into an expansive framework which provides a springboard for individual artistry. Chris Montague’s characteristically oblique guitar style and Jon Scott’s hard-hitting, sparky drumming both of which are unwaveringly inventive join with Simmons’ plaintive trumpet in generating these appropriately drifting, searching panoramas. But, far away from ambient lifelessness, this is a creative band whose energy also frequently crackles with filmic urgency as pulsating, electronic textures erupt into industrial, post-prog fervor. 'Tromelin' (a small, uninhabited sandbank island in the Indian Ocean, east of Madagascar, with a history of shipwrecks and abandoned slaves) is depicted by electronic call signs, dramatic percussion and forlorn trumpet riffs, whilst 'Deception Island' (a natural harbour in the South Pacific Ocean whose early 20th century whaling history saw hundreds of men accommodated there) bubbles with electronic vigor and Ed Begley’s punky vocals; and 'Marie Betsy' (a Deception resident who was the first female ever to be in Antarctica) is portrayed through reverberating swathes of electronics and Montague’s clanging, countrified guitar. Title song 'We Drift Meridian' features the lucid vocals of Emilia Mårtensson, expressing Simmons’ lyrics of isolation with an almost disturbing, empty realism; and 'Mount Terror' (referring to HMS Terror – one of two of Her Majesty’s ships lost off Canada following an abandoned 19th century expedition, but rediscovered as recently as 2014) skitters intensely to Scott’s vital rhythms before becoming submerged by weary, mournful electronics. 'Mount Cerberus' and 'Queen Tirza', too, perpetuate the pervading themes of loneliness and despair as Simmons’ trumpet improvises freely across fluctuating, anguished audio collages. One of the most eery island tales interpreted in both Scott Moorman Adrift and Fiction Afloat – recalls when a 17ft whaler, with a crew of five, went missing off Hawaii. Several years later, a small, Hawaii-registered boat was discovered on atoll Taongi, 2,000 miles away… and a shallow grave alongide revealed a human jawbone which was matched to crew member Scott Moorman’s dental records. Such bizarre, aching hopelessness is represented by chiming repetition, seabird-calling trumpet and, later, Mårtensson’s and Begley’s intertwined vocals which speak of history becoming immortalised in stories. 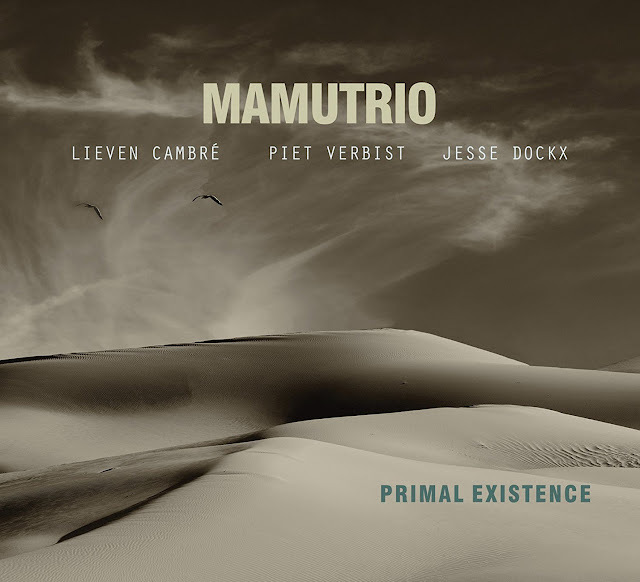 The Belgian saxophone trio Mamutrio was founded under the impulse of the young, talented drummer Jesse Dockx. 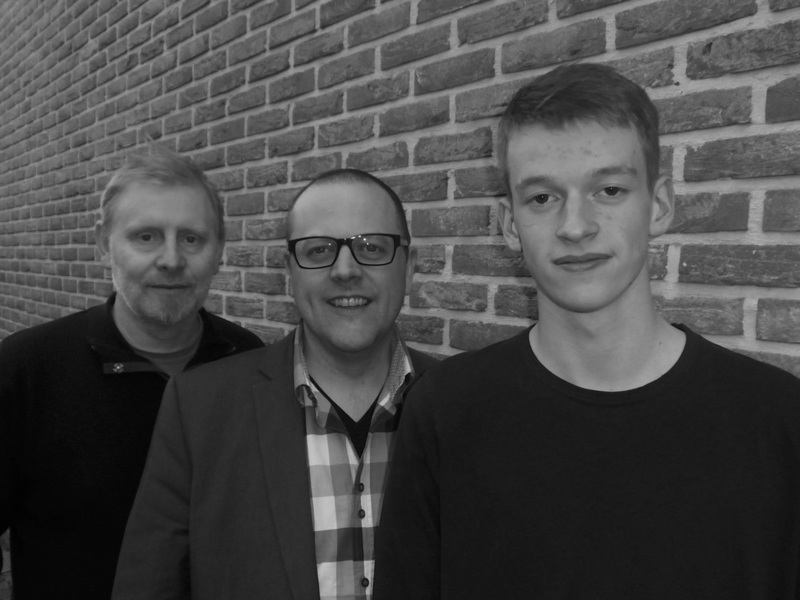 With his former teachers and mentors, bassist Piet Verbist and saxophonist Lieven Cambré, the trio has now performed dozens of concerts around Belgium and presents here its debut recording. Bringing an active performance style with lots of interaction, Mamutrio performs a repertoire that contains mostly originals from the band members, expressing all kinds of moods and influences. 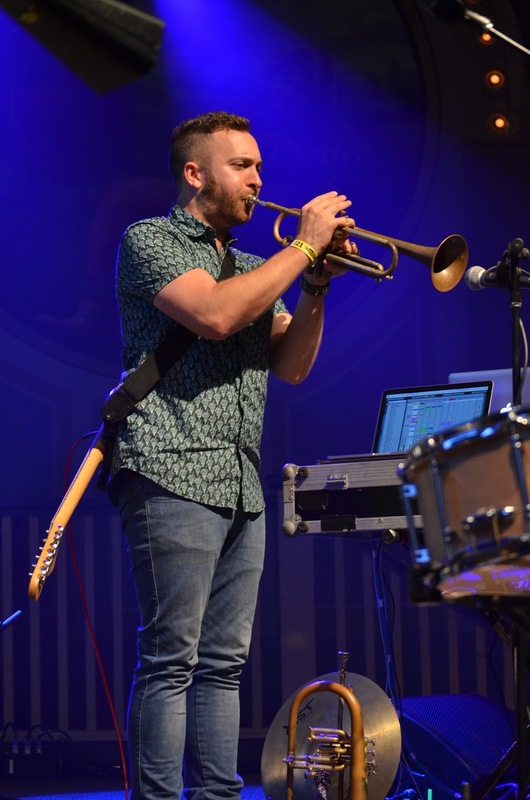 Contemporary jazz with a variety of approaches, from traditional to playful and open, focusing on harmony and melodic interplay in a rhythmic context, challenging and dynamic.